Every time I try to tell someone about this film, I get so excited by it that I end up watching it. It happened again last weekend. I don’t think The Other Guys did very well at the cinemas, which is a darned shame. Here’s the low down. Due to a hilarious mishap, the heroes of the New York City Police Department (Dwayne ‘The Rock’ Johnston and Samuel L Jackson) are no longer the top cops and some of the other guys are trying to step up. Terry Hoitz (Mark Wahlberg) is an excellent cop who made a career destroying mistake which has left him attending a ridiculous support group and partnered with forensic accountant Alan Gamble (Will Ferrell). 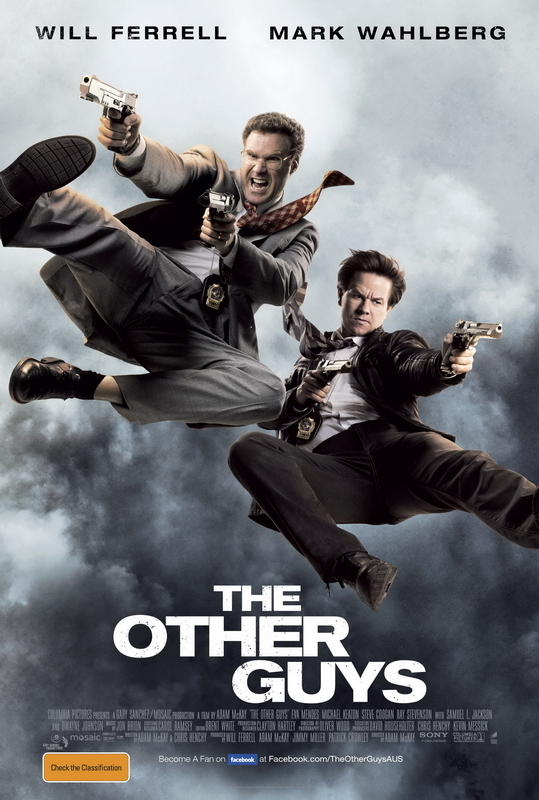 Martin(Rob Riggle) and Fosse (Damon Wayans Jnr) are two other cops desperate to get in on the action, and who are utterly terrible at delivering an action movie-style one-liner. Love it. When Gamble accidentally stumbles across a conspiracy, they have to go rogue to try to find justice. I reckon that the storyline is a bit weak, especially some of the details regarding the conspiracy, but I don’t care. The film is just so funny and absurd that I love it. From the whisper fight to the mysterious attraction of Gamble and the skills that Hoitz developed as a child to bully other children, it’s marvelous. I am a fan of Ferrell, and I think if you don’t like him and his humour, you probably won’t like this film. However, there is an amazing supporting cast including the marvellous Steve Cogan as the incompetent businessman and Eva Mendez as the ‘plain’ wife of Alan Gamble. Plus, it was totally and utterly wonderful to see Michael Keaton back on the screen as the fantastic police chief with a part-time job at Bed, Bath and Beyond who is constantly accidentally quoting TLC. Too good. Now I’ve said all of that, I just want to watch it again. Hilarious. I love this film too. First saw it on telly and was completely surprised at how funny it is. Nothing like our Step Brothers experience! I know – it’s a very different film! Mind you, some of the quotes from Step Brothers are hilarious – I wonder if I could see that again? I know I could sit through the first half… but the rest? Although if it’s not your sense of humour, I reckon you won’t get a lot out of it. I just loved the ridiculous absurdity of the whole thing. Having said that, I thought Zoolander was a waste of space on first viewing, but after talking about it with a few other people, I watched it again and loved it, so who knows?